This spring I went fishing with my friend Fabi. As we weren’t exactly successful the romantic splashing-water-and-fidgeting-fish-summer-documentary has to be postponed ;). 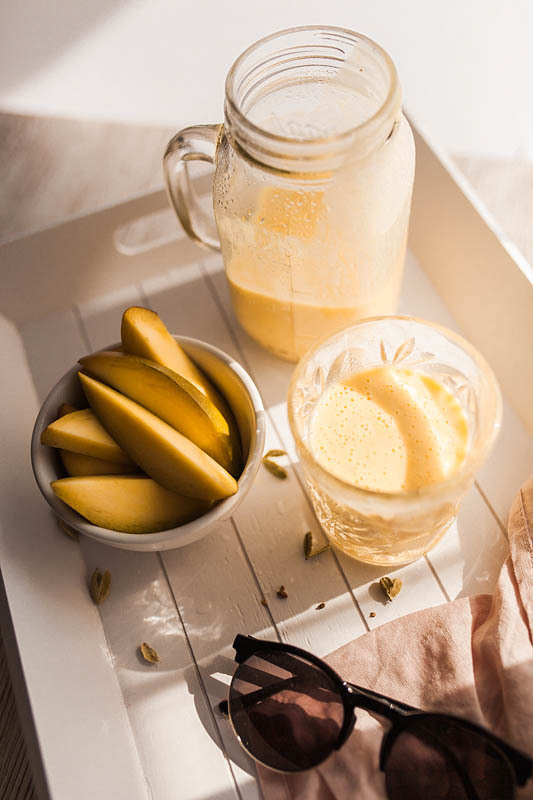 Instead we caught some frozen mango in the supermarket and made a delicious, Indian speciality for those hot summer days – a mango lassi. 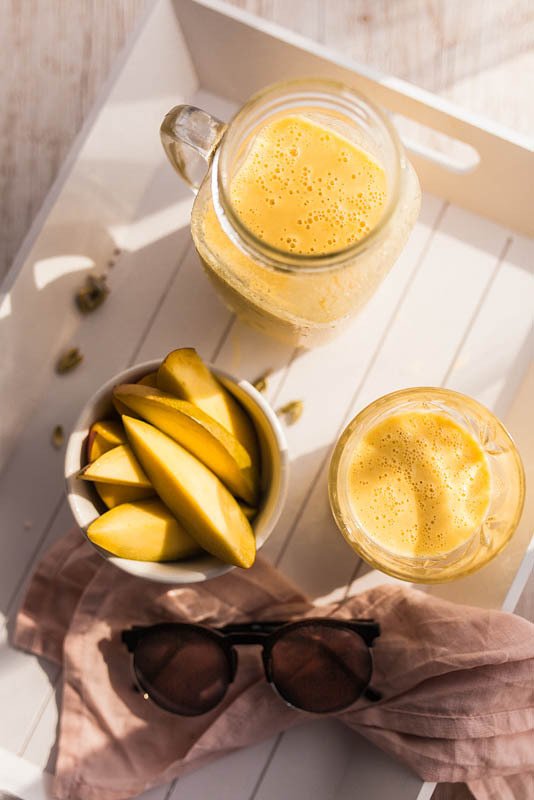 Now, that Germany is ‘suffering’ through the 2 weeks lasting summer heat, I dug out the recipe and inhale a whole blender of mango lassi practically daily. To be honest, I’ve always been more of a vegetable person. Peppers, zucchini, avocado, salad, tomatoes – Yes please! Daily! But my relationship to fruits is a little more complicated. Sometimes I’m craving sweet fruits so immensely that I throw anything I can find in my shopping cart. Do you know that problem? Same applies to smoothies. One day they taste just perfect. Refreshing, sweet, fruity and BAM the next day I can’t stand them anymore. With the mango lassi it’s completely different. I’d say this is thanks to the rather intense spices that make it much more interesting than bovine blended fruits. Cardamom is my friend now. What the heck is a Mango Lassi? A lassi is a yoghurt drink from India and is often served with hot and spicy meals, as the fats from the yoghurt moderate the spiciness of food. Being a German, I can definitely tell from experiences at Indian restaurants that Indian people have a ‘slightly’ different understanding of a ‘hot meal’. The basic ingredients of a lassi are water (or milk) mixed with yoghurt in a 1:1 ratio. You can make a lassi sweet as well as salty. The salty version is comparable to the Turkish drink ayran. 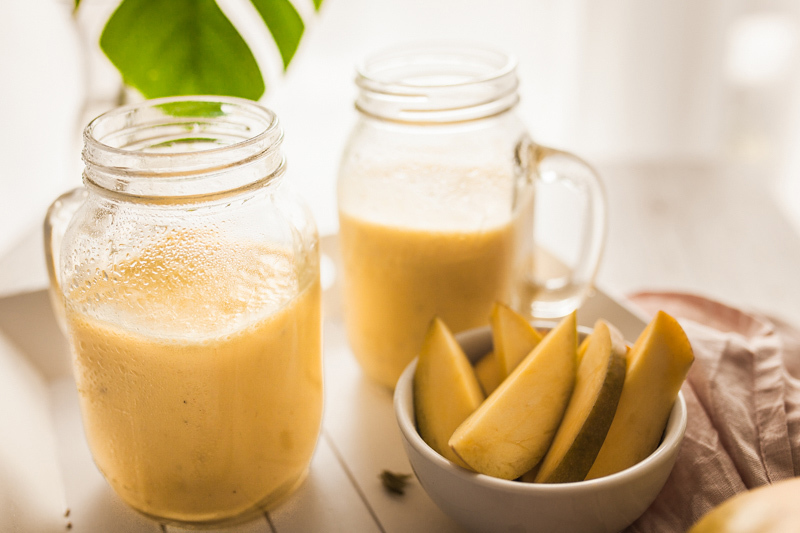 If you go for the sweet lassi, like me, you can add fruit juices oder blended fruits such as mangos. To give it its special Indian aroma you can add all different kinds of spices and extras like cardamom, cumin or even rosewater or vinegar. Our smoothie is kept simple but super delicious. We’ve added cardamom – but you can experiment with other ingredients for sure. Let me know in the comments about your favourite lassi. But why cardamom? And what does it actually taste like? To begin with there’s two different kinds of cardamom – black and green. Both belong to the ginger family and are used a lot in the Asian and Arabic cuisine. If you don’t use cardamom that frequently I’d recommend to buy it whole instead of ground as cardamom loses its aroma very quickly. As most spices, you should store cardamom in a light-tight box. To get rid of the shells you can simply grind it in a mortar. The seeds will fall out of their leafy shells, making it easy for you to sort the shells out and start grinding the cardamom seeds. I have tried this recipe in all kinds of variations for you. 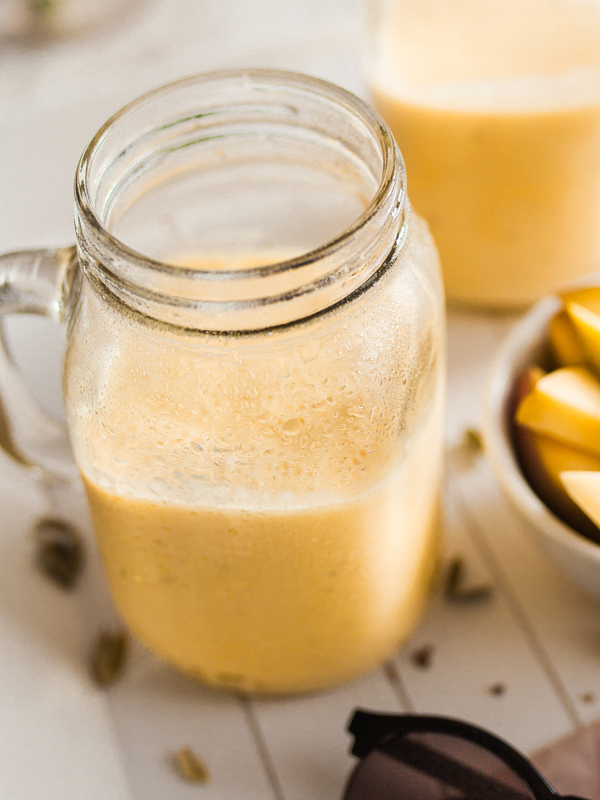 The original mango lassi is made with plain yoghurt. 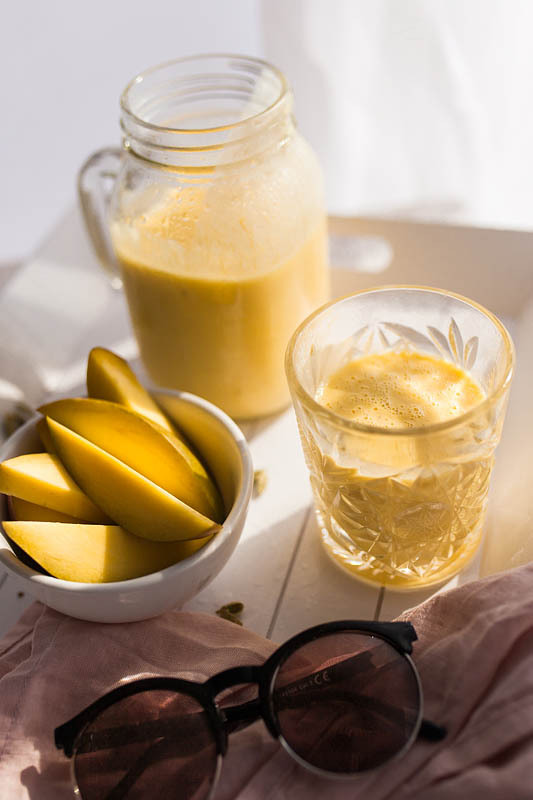 The vegan mango lassi however is fairly easy as well. My first try was with natural soy yoghurt and though I still had a slight hint of the soy taste I wasn’t bothered by it too much. 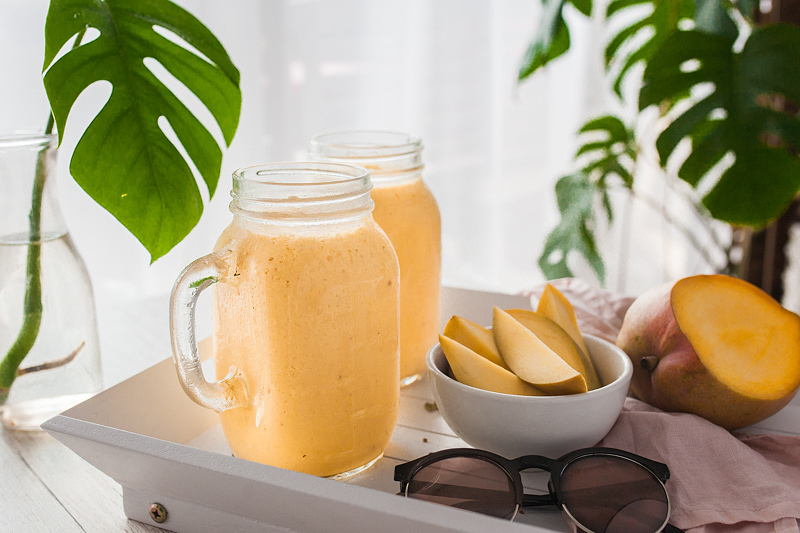 You can always add more mangos or a sweetener of choice to get rid of the soy taste. My personal favourite though was a soy yoghurt with coconut flavour which was simply divine combined with the mango and cardamom. Add the mango, yoghurt and water to a mixer / smoothie maker (an immersion blender should work too, though) and blend until smooth. Add the cardamom to a mortar and beginn by roughly pounding on it to loosen the seeds from their shell. You should now be able to easily remove the leafy shells from the mortar. Then continue grinding the cardamom seeds to a rough powder. Add the cardamom to the mixer and blend again. Add more of the spice to taste. Sweeten with sugar, agave syrup or honey if necessary.